I just turned 40. I have a six-year-old (as of yesterday!) and an eight-month-old. I have a full-time job, a full-time blog, and a full-time wife. I am tired. I’m tired because I rarely get enough sleep, but I’m also tired when I get a full eight hours. I’m even tired when I get extra sleep, because all that does is remind my body how much more sleep I need! I was tired yesterday, I am tired right now, and I will be tired tomorrow, next week, next month, next year, the rest of this decade, and for the foreseeable future. But maybe that’s not such a bad thing? Consistent, perpetual, unavoidable exhaustion is the preeminent parenting stereotype. Or it would be, if it were merely a hyperbolic generalization and not actually a 100% accurate fact of life for every single parent on earth. Parents are tired, and we like to let everyone know it. 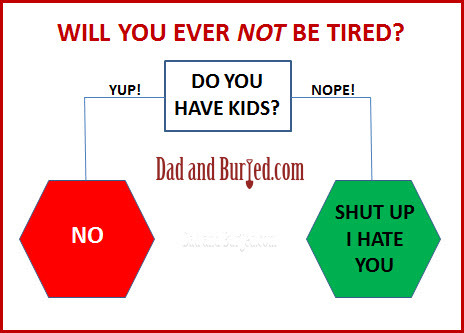 Sometimes when parents talk about being tired, it’s an excuse. Sometimes it’s a resigned lament, sometimes it’s a plainly stated fact, sometimes it’s a meme, or even a veme (guilty as charged!). Most of the time, though, it’s simply a complaint. I know I’m not typically the world’s most glass-half-full kinda guy, but it seems to me that being tired from parenting can be a good thing, if you only look at it the right way. So let’s stop thinking about the energy we’re missing and start thinking about what we’re gaining from busting our butts as parents. I’m tired from being woken up early by the sounds of my infant son crying for food, but seeing his smiling face when I grab him from the crib always puts me in a good mood. I’m tired from getting out of bed early to get my first grader ready for school, from waiting for him to decide what he wants for breakfast, from preparing that first choice and then replacing it with something else, from repeatedly reminding him to get dressed and get his shoes on and go potty, and from waiting for him to kiss Mom and Buried and The Hammer goodbye before we leave, but seeing the love he has for his mother and little brother makes me forget all the preceding aggravation. I’m tired from getting up early to walk him to the bus stop, but holding his hand while we walk – or jog, or straight-out sprint – those few blocks is one of my favorite parts of my day, and when he gets on the bus, he blows me kisses, sends air hugs, and gives me a thumbs up as it drives away. Every day. I’m tired from going to the gym to try to stay healthy and fit, but it helps me keep up with my kids, one of whom can’t stop running and the other of whom can’t wait to start. I’m tired from spending long days at work, but it allows me to feed, clothe, educate, and entertain my family, and I’m tired from my long, crowded commute home on the subway, but it gets me back to them every single night. I’m tired from lifting my baby in my arms to comfort and play with him, but holding him in the air like Superman and giving him sloppy kisses makes him laugh, and his laugh is the happiest sound I’ve ever heard. I’m tired from bribing my six-year-old with dessert and/or threatening him with withholding dessert, but sometimes it actually works and gets him to eat his dinner, and when it doesn’t, I get to eat his dessert. I’m tired from trying to pry even just the tiniest details about his school day from him, but the way he lights up when he actually tells me something – i.e., how excited he was to get laboratory goggles in science class – is worth the struggle. I’m tired from answering his countless questions, but at least he still looks to me to answer them. I’m tired from getting on the floor and playing Transformers or superheroes with him before bed, but he usually lets me be Superman. I’m tired from arguing with my son about going to bed, from constantly telling him no, from carrying him to the bathroom in my arms, from helping him brush his teeth, from reading him a bedtime story, but sometimes that’s the time I get with him and I’ll take it. I’m tired from climbing into bed with him for a snuggle, but man do I love a good snuggle. I’m tired from talking to Mom and Buried about my first grader’s challenges at school, his trouble with bullies, how he’s adjusting to having a brother, how to get him more interested in math/reading/sports, but it’s invaluable to have a partner with whom to navigate all this. I’m tired from talking to Mom and Buried about how to handle my baby’s teething, and his increasingly erratic sleep patterns, and his slightly alarming cough, but she usually knows what to do, and I can’t imagine doing this without her. I’m tired from trying to get in a few extra hours of kid-free time with my wife of nearly ten years, but sometimes she scratches my back while we watch Netflix. I’m tired from not being able to sleep once my six-year-old has climbed into the bed and snuggled up to me, but he’s still small enough to (barely) fit in bed next to us. I’m tired from a full life surrounded by the wife and children I love, and isn’t that what it’s all about? See? If you think about it, being tired is something to celebrate! Exhaustion in the service of your children and your family shouldn’t be a cross to bear, it should be a badge of honor. It’s still worthy of the occasional complaint – god knows I’m not immune to whining about passing out before the movie ends and my kids waking me up before the rooster crows – but a little perspective helps remind me that some sacrifices are not only necessary, they’re worth it. We’re tired because we love our families. And that means we’re tired because we’re doing it right. Click here to respond to this post – and tell me what makes you tired – on my Facebook page! But thanks for the reminders. Awww Happy 6th birthday, Detective Munch!